From modern skyscrapers to iconic bridges to centuries old cathedrals, the architecture and design of a city often sets it apart. When that architecture represents a blend of the old and the new, we have the delight of strolling through the past and present interchangeably as we explore. This is certainly true of my home city—New York—where the Empire State Building, One World Trade Center and St. Patrick’s Cathedral each represent a different era. The same is true in many cities around the world. Here are a few of my favorite cities that effortlessly merge the past and present through architecture and design. Montreal was the first North American city to be appointed a UNESCO City of Design and when it comes to cities that blend the past and present through architecture, it’s hard to beat. Grab yourself one of Montreal’s delicious bagels and step back in time as you stroll the cobblestone streets of Old Montreal amid 18th and 19th century stone buildings. Illustrating the city’s blend of past and present, in the Quarter International heritage buildings stand alongside modern skyscrapers. Home to boutiques, restaurants and offices, the World Trade Center complex spans an entire city block encompassing several restored historic buildings under a spectacular glass roof creating a striking atrium. Appropriately housed in a contemporary building merged with a grand 19th century house, is the Canadian Center for Architecture. An international research institution, the center’s goal is to increase public awareness of the role of architecture in contemporary society. Built in 1906 as a symbol of prosperity after Queen Victoria awarded Belfast city status, Belfast City Hall is a stunner. With an elaborately designed stone exterior constructed in the Baroque Revival style, the building surrounds an inner courtyard and covers 1 ½ acres. Wearing a copper dome as its crown and showcasing a grand staircase of Italian marble, Belfast City Hall feels more like a palace than a civic building. 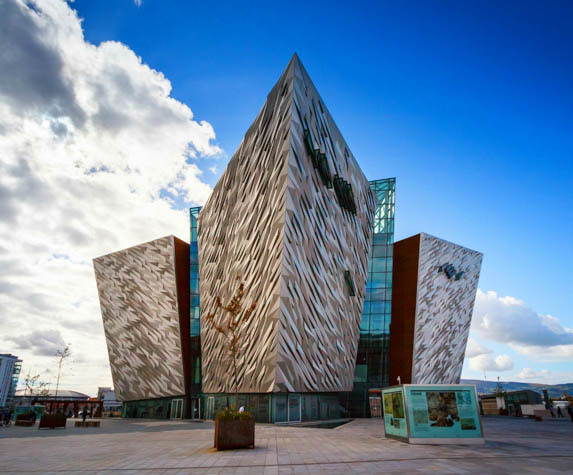 Housed in an iconic 6-story building clad in 3,000 individual silver anodized aluminum shards, the high-tech experience, Titanic Belfast, is the city’s biggest attraction. Located in the Titanic quarter where the ill-fated ship was built, the attraction stands 126 feet high—the same height as the Titanic’s hull. It’s meant to reflect Belfast's history of ship making and the industrial legacy bequeathed by Harland & Wolff. The building’s angular shape is meant to resemble a ship’s bow, but there are those who think it looks more like an iceberg. I suppose either one is appropriate, but I’d go with a ship’s bow just to be safe. When it comes to architectural styles, Manchester has it all: modern, contemporary, Georgian, Roman and Gothic. A product of the Industrial Revolution, Manchester is known for its warehouses, cotton mills, viaducts and canals. One of the city’s most spectacular historic structures is the neo-gothic Town Hall. Completed in 1877, this impressive building faces Albert Square—Manchester’s central public square. Manchester is also the birthplace of the first true railway station which was responsible for the city’s wealth during the Victorian era when it was used for importing goods during the Industrial Revolution. Evidence of the Victorian era influence is still present throughout the city. Modern buildings began to emerge in a big way after the 1996 IRA bombing of the city. The Beetham Tower—Manchester’s first true skyscraper and an iconic part of the city skyline—has won many architecture and design awards. It’s possibly the best example of the new wave of bold architecture in Manchester. And don’t miss the Lowry, Manchester’s ultra-modern waterside arts complex with two theaters and galleries showcasing works by LS Lowry. Norway is renowned for its spectacular natural beauty, but it’s also adept at blending the past and present through architecture—especially in Oslo. Old Acker Church is the city’s oldest remaining building and the only enduring church from the Middle Ages. A stone church built as a three-naved Roman-style basilica, the church has suffered through fires and pillaging numerous times. Its oldest section dates to the 12th-century. Seemingly rising from the waters of the harbor, Oslo’s Opera House is a striking example of modern architecture. Designed by the Norwegian architecture firm Snøhetta, the main hall is horseshoe shaped and large street level windows allow passersby a peek at the rehearsals and workshop activities inside. Be sure to climb up to the roof and take in the sweeping views of Oslo and the surrounding fjord. Because even when you’re traveling for architecture, natural beauty still deserves our admiration. What are your favorite cities for appreciating architecture?